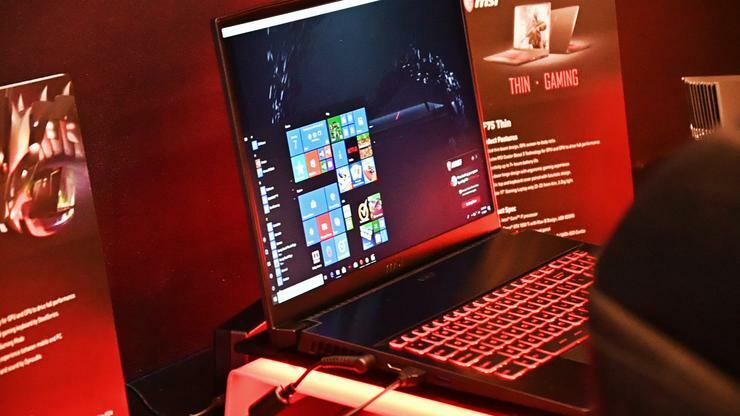 Following on the success of the GS65 Stealth Thin, MSI are looking to offer a similar cocktail of RTX-powered performance and slim form-factor with the new GS75 Stealth. Like the GS65, the GS75 Stealth features super-thin bezels, 8th Gen Intel Core Processors and a slim design with copper accents. The big difference here is size. The GS75 Stealth features a 17-inch FHD display with a 144Hz refresh rate to the earlier GS65's 15.6-inch one. It also features a wider, more rectangular trackpad and Nvidia's new RTX 2080 Max-Q GPU. That said, despite this difference, we didn't notice a huge difference in the weight of the new GS75 Stealth compared to the older GS65. As with its predecessors, the GS75 Stealth also features MSI's usual staple of features: Cooler Boost 3, Dynaudio speakers, ESS Sabre audio card, Nahimic 3 audio enhancer, Killer Wi-Fi plus a Steelseries RGB keyboard. A new version of the existing GS65 that includes Nvidia RTX 2080 graphics is also inbound. Official Australian pricing for the MSI GS75 has yet to be announced but the gaming notebook has been confirmed for the Australian market and will arrive next year.